Daniel Kahneman claims that differences in the performance of professional investors are mostly due to luck, whereas compensation is awarded as if differences are due to skill. Most alpha is fake alpha. This of course raises all sorts of questions about why such people are allowed to become so extravagantly wealthy. The usual argument is that their investment decisions lead to more efficient resource allocation in the economy. (They are a "necessary evil" of a capitalist market system that benefits all of us :-) But if the decisions of the highest paid professionals are no better than those of average professionals, we could replace the services of the highest earners at much lower cost (or cap their salaries or impose high marginal tax rates) without negatively impacting the overall quality of decisions or the efficiency of the economy. NYTimes: ... No one in the firm seemed to be aware of the nature of the game that its stock pickers were playing. The advisers themselves felt they were competent professionals performing a task that was difficult but not impossible, and their superiors agreed. On the evening before the seminar, Richard Thaler and I had dinner with some of the top executives of the firm, the people who decide on the size of bonuses. We asked them to guess the year-to-year correlation in the rankings of individual advisers. They thought they knew what was coming and smiled as they said, “not very high” or “performance certainly fluctuates.” It quickly became clear, however, that no one expected the average correlation to be zero. But there may be areas where *the differences between high level professionals* (e.g., people who have been hired to run money, have top MBAs or graduate degrees, etc.) are statistically seen to be mostly due to luck. This has already been convincingly demonstrated for pundits or analysts of complex world events by Tetlock's studies of expertise. (You can find several posts on this blog on the topic.) Whether it's true of money managers (or even big company CEOs) is controversial. If you argue the skill side, I'd like to see *your* statistical evidence, not just repetition of your priors (again and again). In all areas of human activity, even the skill dominated ones, luck plays a big factor. This is a good argument for redistribution -- almost every successful person owes some of their success to luck. It seems to me that the 20th century trend in democracies is toward greater redistribution: social safety nets, guaranteed minimum income, etc. People have been conditioned to believe these are aspects of a just society. One argument is that we have to let the rich get rich in order to have strong economic growth. Too much redistribution means a smaller pie to split. But the Illusion of Skill argument (if correct) suggests that for some activities like finance a high marginal tax rate (say, which kicks in above the income of the *average* finance professional; this would then only affect the top earning financiers who, according to the argument are not adding any real value that the average guys can't also provide) would not negatively affect economic efficiency. If people irrationally and incorrectly believe that only Harvard MDs are capable of treating pneumonia, and bid up their compensation to exorbitant levels (levels so high that the Harvard MDs begin exerting financial and political control over society as a whole), wouldn't it be better for society to impose a high tax rate on Harvard MDs, which kicks in above the income of other doctors with similar credentials (but who are not beneficiaries of the irrational belief)? Investment advisors are mostly not selling alpha. They are selling denial of responsibility, colloquially they are selling CYA. Suppose you're a city bureaucrat who's been given responsibility for the pension fund. You need to make investment decisions. Of course, you aren't going to make them yourself; you're not qualified. Furthermore, you'd have to take the blame any time the return was too low or the investment included companies doing business in Myanmar or when the mayor put pressure on you to sock away money in Solyndra. So you hire a firm to make the decisions. What investment firms sell is mostly denial of responsibility and they sell it to people like your bureaucrat who don't much care about alpha. Keeping a bonus system based on returns and hiring Ivy League grads and famous names provides the key value for the firm. So the bonus system is an essential business advantage. Providing more alpha would not be a business advantage because the people in charge of investment funds don't care much about alpha as long as it's about the average their fellow bureaucrats have been getting. Well galtonx. With replies like that you should be a billionaire in no time. Perhaps. But who would do the hard work and backbreaking labor necessary to produce wealth on this hypothetical island of yours? And would that labor be enforced or coerced? Are they (the lessors) even there in your vision? Perhaps that just a convienent error of omission in your wealth generating formula. Your two posts are some of the most amazingly construed pieces BS I have read in quite some time. Please continue to post them and humor me. I forgot to add: I am in on the alleged IPO of Groupon. I will have some shares I can sell you--cheap. After the initial offering. It will be a good deal-for you! Call me. Not all of Wall Street is picking stocks. A lot comes from being able to handle assets and deals that are beyond the reach of your average financial advisor. And as an entrepreneur yourself, wouldn't you say that your ability to judge whether a company will make money is better than the average person? Complete diversification is optimal only for someone who has literally no edge in determining whether one firm is better than another. By that argument, socialism must be perfect as well as capitalism, because Russia had a lot more metal objects in 1991 than 1917. Claims to superior expertise in those areas are not necessarily more valid. They may just be harder to check. If you read the whole article, you see that Kahneman does believe in skill. For example, his studies show that some doctors are better at diagnosis than others. I am also sure that some entrepreneurs or some physicists or some athletes are better than others. "But if the decisions of the highest paid professionals are no better than those of the average professional, we could..."
Wrong. Even though who wins is determined by lottery, it wouldn't be if only one guy played the game sincerely. All will play less sincerely when they know that the prize is having their head cut off. Actually that's one of the lamer arguments. Private equity funds invest directly and sometimes manage. Securities and derivatives funds don't. Secondary offerings are usually just employee compensation. What money managers do is determine price which tells Ben Bernanke what to do, tells business execs whether a recession is expected, tells execs if they're doing a good job or not, tells consumers to save more, etc. Buying new securities from corporate finance departments is a very small part of it. Money managers also manage risk more effectively than their investors would individually. Managing risk is really doing something. "no better than those of the average professional" Sorry, I should have written "than those of average professionals". "Money managers also manage risk more effectively than their investors would individually." I'm comparing one professional against another, not against non-professionals. Kahneman's new book of which this article is based on, and Emanuel Derman's"Models Behaving Badly" are out on Amazon Kindle today. "Investment advisors are mostly not selling alpha. They are selling denial of responsibility, colloquially they are selling CYA." This is an important point. It's worthwhile taking a detached anthropological view of the financial services world occasionally, rather than letting yourself be distracted by the jargon and patter which practitioners present as the 'subject matter'. Daniel Dennett retells a marvelous story about a magic trick called "The Tuned Deck" which I find resonates well with the concept of 'alpha'. It's a helpful reminder that there is always a sort of psychological poker game in progress that wraps around whatever elaborate system of rules, valuation principles, formulas, HFT algorithms, etc. are ostensibly defining and measuring our 'skill'. 1. They cause people who might otherwise have simply left all their money in a zero interest checking account to invest in something that almost surely has higher average returns. 2. They cause people to diversify through asset allocations that provide greater risk to return than simply picking a stock or two and seeing how it does. 3. They cause people not to panic as a result of moderate day to day market fluctuations which would otherwise cause them to buy high and sell low. 4. They cause people to make whatever investments they choose to make in a tax sensitive way. 5. They cause people to understand at a ballpark level how much they must save to meet their goals (almost always higher than the amount that they would have saved otherwise) and how much they can afford to spend from investments once they retire (sometimes less than their naiive instincts, but also sometimes liberating them to spend more freeing them from a retirement of unnecessary scarcity). Picking winners is a matter of luck. But, many of the other benefits mentioned have more substance. The responsibility bit isn't trivial. A registered investment advisor may make mediocre stock picks, but is unlikely to invest in a Ponzi scheme or simply convert customer money into gold, put it on his yacht and sail away. This happens with surprising regularity with non-professionals, particularly less affluent and less sophisticated non-professional investors like friend and family trustees of medium to large trusts for children or people under disabilities or heirs. What about buffett & the guys he calls out in his 'superinvestors of graham & doddsville' speech....were they lucky enough to operate at a time when the pickings were easy ? Berkshire's growth has slowed substantially in the 2000s (but still beats the s&p handily). Buffett claims this is because Berkshire is simply too big, and that if he were allocating the amount of capital that he used to 30 yrs ago, he could guarantee 50% returns. Nassim Taleb sees his main challenge as mapping his ideas of "robustification" and “anti-fragility", that is, how to live and act in a world we do not understand and build robustness to black swan events. But how does one make a model of that? That is-predicting when large events on the extreme ends of a gaussian curve wreak havoc on the norm. I don’t think one can, but one can and should take them into account (the barbell curve), knowing they will happen sooner or later even if in gaussian function practice they are mostly thrown out or deemed as irrelevant. To me-and certainly not only me- they are the most relevant events even if they are next to impossible to predict. So that’s why I agree with the premise winning long term stock picking (or making correct life decisions) is more a matter of luck than skill. Although one can observe human behavior and see what others are buying and make at least short term “safe” bets on that. Oil companies? And perhaps longer ones-assuming the dreaded out of left (or right) field event doesn’t happen and destroy your model. That’s what Peter Lynch used to do but when his Magellan Fund got so large and unwieldily he was no longer able to stay ahead of the game and his return fell to the norm. Maybe even below--I forget. He did manage to quit while he was ahead. "This is a good argument for redistribution -- almost every successful person owes some of their success to luck." Yes, and so what? What entitles you (or anyone else) to claim the spoils of a lotto player for yourself (or anyone else)? It may very well be that investment decisions made by the "top professionals" are not better than average. This has been known about performance of mutual fund managers for a long time, after all. However to claim that these people are "unskilled", to draw a conclusion they should not be compensated at market levels because of their "lack of skill", or that they could be replaced by average execs off the street without any harm is missing the point completely. The main "skill" of those people lies in influencing decisions of other important people. Their exorbitant bonuses are rightfully viewed as a compensation for their skill of climbing social ladders and their skill of doing no harm, having reached the top. It's the same tired argument as "how come the stupid lawyer/executive makes so much more money than a university professor?". Superior luck? Try again. Or find a way to measure the right skills before publishing triumphant research papers that will be shrugged off (for a reason that the researcher apparently can't grasp). Lots of movie stars and musicians get defrauded by their managers, and it probably happens even more to NBA and NFL players. That could provide a competitive advantage in recruiting for a college backed by a billionaire sugar daddy like Phil Knight at Oregon or T. Boone Pickens at Oklahoma State. Would the NCAA let college coaches tell high school stars' moms: "Ma'am, if your son makes it to the pros, Mr. Pickens provides a team of financial managers and agents that he personally backs to be honest." It would be a conflict of interest for Phil Knight of Nike/U. of Oregon, says stars have to negotiate with Nike, but an oilman could be disinterested. Human beings are most interested in competitions that tend toward being a toss-up: e.g., the World Series rather than tonight's Harlem Globetrotters-Washington Capitals game or picking stocks rather than picking when the sun will come up tomorrow. Steve, leaving aside your premise for now...why do you believe that those with the power to redistribute will redistribute to the poor, or to you, or to someone more deserving than the people they are taking it from? That has not been the experience of history. Redistribution is a bit of a euphemism, after all. People only pay taxes because the IRS has guns. One argument is that we have to let the rich get rich in order to have strong economic growth. Too much redistribution means a smaller pie to split. But the Illusion of Skill argument (if correct) suggests that for some activities a high marginal tax rate (say, which kicks in above the income of the *average* finance professional; this would then only affect the top earners who, according to the argument are not adding any real value that the average guys can't also provide) would not negatively affect economic efficiency. If people irrationally and incorrectly believe that only Harvard MDs are capable of treating pneumonia, and bid up their hourly rates to exorbitant levels (levels so high that the Harvard MDs began exerting financial and political control over society as a whole), wouldn't it be better if society imposed a high tax rate on Harvard MDs, which kicks in just above the income of other doctors with similar credentials, but who are not beneficiaries of the irrational belief? It seems this study suffers from both small sample size and restriction of range. Of course within a firm where everyone has similar intelligence, expertise, and ambition, there would be virtually no correlation between skill and success just as there is no correlation between height and performance among NBA play players, but if you compared Warren Buffet to a street beggar, I suspect the former would be consistently a lot better at picking stocks. Similarly, if you compared Michael Jordan to the average teenager who flunks gym, Jordan would be a foot taller, but among other NBA players, Jordan has no height advantage. For apparently not recognizing something so obvious, the real illusion of skill might be with the person who wrote the article. who are not beneficiaries of the irrational belief)?" Your faith in the market is excessive. "do the same job for one tenth of the price but equal the productivity"
Kahneman gave the managers of the firm he studied evidence that they were paying for luck and could get the same performance at a much lower price. Because of what I like to call "bounded cognition" (but you could also refer to as a market failure), they didn't act on the evidence (they could not accept it, just as you cannot; it was not a matter of arguing over statistical technique). The same applies to mutual fund investors who pay for active management (which underperforms indexing) year after year. In my pneumonia example people with bounded cognition could easily ignore the statistical evidence that Ohio State MDs cure pneumonia just as effectively as Harvard MDs. The problem is that people in general do not understand statistical evidence very well. As you know, Kahneman's work demonstrates over and over again that people deviate from "rationality" and this limits the effectiveness of markets. What if there is another disease which really only Harvard MDs can cure? Wouldn't your redistribution proposal backfire by eliminating an incentive to become a Harvard MD *regardless* of the skill argument? Sounds like throwing the baby out with bathwater. You just identified why Nassim T. is a sham. On the same grounds that I don't buy insurance for all imaginable tragic events that may lead to my sudden demise, I don't care about "black swan" events in the world of finance. No, they are not "the most relevant events". They are about as relevant as a meteor hitting the Earth and causing global extinction or a rare lethal form of cancer developing in me as I write this. Yes, could happen. No, I can't prepare. Ergo, I don't care. "or impose high marginal tax rates"
Yes very good idea. The code is too complex but it is too simple in one respect. It doesn't distinguish how individuals make their money except with the wage vs cap gains distinction. As far as I know anyway. So a pornographer, McDonald's VP, or Ivy League college professor who makes 250k per year is taxed at the same rate as a successful machine tool salesman or engineering/science vp. We don't want no social engineerin' round here. 2. without pay for performance some or all will not perform and there will be a detectable difference is skill. 3. BUT, obviously the pay for performance may be far above what's necessary to get the best out of the players. Securities and derivatives markets should never be thought of as irreducibly random. Prices are determined by a finite number of human and computer decisions. Ever greater technique brought to bear on these decisions necessarily drives these markets closer and closer to apparent irreducible randomness. The apparent randomness is actually evidence of expertise if you like. "The apparent randomness is actually evidence of expertise ..."
But this argument does not apply to "expert" analysis of world events (see Tetlock). It could just be that markets (which are themselves affected by exogenous world events) are highly complex and nonlinear, so hard to predict even if still very far from perfect efficiency. matter of arguing over statistical technique)." They could not accept it because they don't have to. All of their competitors are equally irrational so they can get away with bounded cognition or denial or whatever their problem may be. Most people who are leaders in business, politics, media etc probably have IQ's in the 120-140 range. Every once in a while someone like Bill Gates with an IQ of 170 will come along and totally obliterate the competition but it is rare to find such genius, work ethic, luck and entrepreneurial spirit in one person . The problem is there are too few people with IQ's above 150 to go around, and what few there are often have no ambition and drop out of college and many of the rest devote their lives to academia and the ones that go into business are so scattered among the myriad of industries that their presence is hardly felt. As a result, the bulk of the elite world is dominated by people with sub-genius IQ's who can easily dominate the average IQ people without having to worry about competition from the geniuses, and when a genius does come along, the fact that said genius chose business instead of academia suggests that that genius did not benefit from graduate level statistical education. Perhaps the solution is to bring in genius IQ immigrants who have both statistical education (i.e. 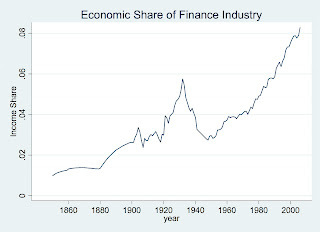 unbounded cognition) and entrepreneurial ambitions in the investment industry. Introducing this new group should help balance America's economic eco-system. Alpha is real, but it depends how we define alpha. When I worked on the street myself and many people I knew generated alpha as defined by superior risk adjusted profits for our firms. However, these profits came from knowing something others didn't know, or knowing something faster, or understanding something because we were smart and plugged in while our clients weren't and could be mislead. It wasn't alpha in the sense of increasing the ROI of capital by allocating it better. Which, on a societal scale, is what matters. Alpha generated by winning a zero sum game is just distributional alpha, not real alpha. IMO, based on my time on the street, less then 20% of what people call "alpha" is genuine work put into matching capital with investment in an efficient manner. This is why we should heavily regulate the street and make people justify whether something they are doing has a societal benefit in the efficient allocation of capital. As for redistribution, I would be wary. Let's say we agree that tech start ups are a winner take all lottery. If you tax start up winners what is to say that will benefit the losers? How would you figure out which start up losers deserve money, or define what a start up is. Isn't Solyndra a good example of the problems with such policy. IMO, the simplest thing to do is have universal HC (have people choose their career based on skills and temperament not health status) and have a guaranteed income to replace all current welfare. Those are the only programs that are simple and have a track record of working. Thing is though, they could be implemented at current tax/GDP levels if our government wasn't so retarded. Do you want to guarantee income for everyone in the world, or for just the citizens of the U.S.? Have you actually read at least one of Taleb's books? What is this "luck"? Can we not attribute it at all to the individual? Is not luck just too complex for us to understand? Does that mean that we hold no claim to its benefit? I was recently told that randomness is a key factor for intelligence. What is this randomness? is it not just complexity beyond our comprehension? Does that imply that we are divorced from it? "The Russian factories were so bad that the tractors were worth more as scrap metal". In the absence of price signals, you do not create wealth.